As Program Specialist of AIT Extension, Asian Institute of Technology, Ms. Narumon supervises a team in designing and conducting international training courses in the areas of management of training centers, training of trainers, development of training materials, and educational aspects. She leads preparation of training proposals, designing training curriculum and learning activities to be submitted to funding agencies and client organizations. She also serves as a trainer for training courses in the area of e-learning, training materials development, use of technology in training. 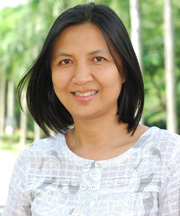 In July 2013, she served as a co-facilitator / Course Director of the training program on planning, monitoring and budgeting education programs for the World Bank funded project on Education For All –Fast Track Initiatives for educators and government officials from the Ministry of Education and Sports, Lao PDR. In the recent past, Ms. Narumon was the lead facilitator of AIT Extension’s short courses for Faculty Sensitization Programs and Leadership Development Program for Education Managers/Administrators. The programs were carried out under the Higher Education Commission of the Government of Pakistan and Afghanistan. She also runs similar programs for GIZ’s Education Development Project under Directorate for Staff Development, Punjab, Pakistan. In these programs, action plan development tool was used for assessing results produced by the participants. Ms. Narumon also developed on-line tools used for assessing training needs of target trainees as well as online evaluation tools for the evaluation of capacity enhancement projects carried out by AIT Extension. Prior to working at AIT, Ms. Narumon was a Program Specialist of the Information and Knowledge Management Program (IKMP), Mekong Institute (MI), Khon Kaen, Thailand. She also worked as a Graduate Teaching Assistant at Online Master’s Degree Program in Human Resource Education (HRE Online), College of Education, University of Illinois at Urbana-Champaign, USA in 2000-2007. Ms. Narumon earned her B.Ed. (Teaching English) from Chiangmai University, Thailand and M.Ed. (Educational Technology and Communications) from Chulalongkorn University, Thailand.